Customers who have used the services of Easy Mobility will know how welcoming, friendly and helpful the staff are. 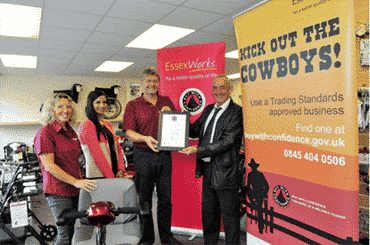 Now, their commitment to providing a good service and ensuring customer satisfaction have been recognised with the Buy With Confidence Scheme which is approved by Trading Standards. Julie Bell, marketing manager, says: “Receiving the Buy With Confidence Scheme approval is a wonderful accolade for us and proves we are a trusted business. Membership of the scheme is not given lightly, among other checks, each applicant will have their complaints history reviewed and will receive a visit from Trading Standards. Good references are required from previous customers and applicants must agree to abide by the scheme’s code of conduct, which requires them to follow the letter and spirit of the law. Paul Vicary, owner of Easy Mobility, has been supplying and servicing mobility equipment including mobility scooters, power chairs and stairlifts throughout the south-east for over a decade. With existing customers supporting the company with repeat business and recommending them to friends and family, Easy Mobility have grown to become one of the largest suppliers of mobility products. The company is also a supplier to charities, local authorities, the NHS and Shopmobility schemes, and can also supply and provide warranty and aftercare for scooters and power chairs throughout East Anglia. “Care for the customer” is what the team strives for and this level of service is echoed at all five of Easy Mobility’s shops in Braintree, Chelmsford ,Clacton, Colchester, and our service centre. The Buy With Confidence Scheme applies to all five locations.